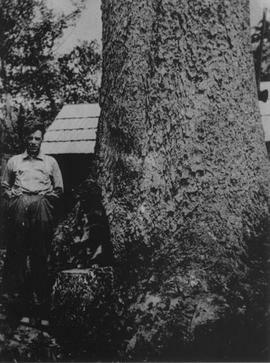 Bob Bruce came from Nova Scotia to Brackendale in 1912 to work in logging. Donald McCallum came to Squamish in 1909. He married Margaret Dewar in March 1913. She owned the first cafe: The Waltz Inn Cafe. He retired and left Squamish in 1949. Harness racing at Pat Brennan's track, Smokey Downs. The Herres Farm was once located in a field by Leski's crossings was burnt down in 1929. Left to right: Olive and Wilby Judd on horse at the Judd farm in 1897. Pat Brennan (#4 racer) harness racing on Smokey Downs track during the Loggers Sports Celebration.Pat Brennan and Al Hendrickson organized the first Loggers Sports Day held from 1-5pm on September 1, 1958.